In 1976, America was gussied up for its bicentennial: the 200th birthday of the Declaration of Independence. America’s president and host for the occasion was a man its people never voted into office and its Supreme Court was one that celebrated on the eve of the event by ruling the death penalty as neither inherently cruel nor unusual. The spectacular itself would see one of America’s favorite imports, Elton John, singing “Philadelphia Freedom” while technically still in the closet. Megan Volpert’s book, 1976, takes a cue from Elton and gonzo journalism to shine a light on the bicentennial election year with great brio and wit. Under Volpert’s spotlight are the country’s historical and cultural parades boasting a familiar crowd of political eccentrics and rock stars waving the flag for an America in love with its own independence. Volpert’s prose is an amp plugged in and turned up to eleven. 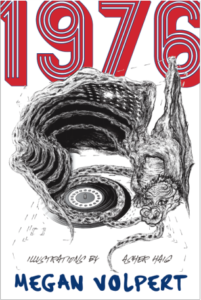 Volpert’s book, at least in part, is a straightforward account of the chronological events of the year 1976, most of which are focused on rock and roll, art, and politics. Nestled between prologue and epitaph-as-epilogue are chapters named for each month of the year, allowing the reader to curl up in January to wind — by unwinding — the hands of time. The book also features illustrations from Asher Haig (Robert Crumb meets Scary Stories to Tell in the Dark meets gig poster stapled to a tree). In a brief interlude about halfway through the year that breaks July into two chapters, Volpert freezes time to offer the best tips for ZZ Top concert-going and what to do with a full bladder and long line at the honey bucket. After this, it’s straight on again through the Son of Sam summer months to see Jimmy Carter crowned Mr. November, all before a December finish line. Volpert’s 1976 keeps time with album drop dates, counted ballot boxes, and race riots, and it highlights the deaths of lesser-known members of The Supremes, the average duration of presidential phone calls, and the winning word from the year’s national spelling bee (it was narcolepsy). This is not to give anything away only to point out that while Volpert’s vision of history is chronological, it is not necessarily hierarchical. In a moment of retrospeculation, present day Volpert remembers her first encounter with the 1976 debut album of the Ramones. She was a teenager and it was right after the invention of the compact disk. Wayne was picking through the shelves with me a little bit and I asked who his favorite band was. We crouched down to the lowest shelf and he unhesitatingly went for a case with a black and white photo on the front. You know what I’m talking about. It’s the debut album with those motherfuckers in their well-worn leather and worn-through denim lined up all cool against the bricks. They don’t care if you’re gawking at them or giving them the stink eye. In fact go on and do it, because they draw power off the vibe of middle class suburban judgment like it’s a goddamn electrical socket. I’d never heard of them. That night, we didn’t even listen to them. But I loved them already. I knew from jump that the Ramones were my people. It was of secondary concern that I take a moment to hear the album; the point is that I was instantly far less lonely. That photo said everything I needed to hear. Volpert shops for a coat; she visits her in-laws, she takes her niece to see Joan Jett. She is in her early thirties, which means she is either leading the pack of millennial baton twirlers or coming up caboose with the gen-x unicorns. In many ways, the book is as much about being on the cusp as it is about being in-between. Volpert is an Obama-supporting, married, gay educator, who, by her own definition, has had all of her eggs make it “safely into the misshapen hand basket of the American Dream.” Volpert tackles the domestic and familial, though not in the ways one might expect. If one is looking for the trappings of a queer memoir, then on the surface 1976 may not seem to offer much. There is nary a coming out story over which to shed a heartwarming tear and when we meet Volpert, she is already married to “a nice Jewish girl from Long Island.” But Volpert and her wife do encounter America-at-large in ways that will feel all too familiar to queer readers. Queerness, like Volpert, is not always at the center; but central to the book is the hiccupped delay of queer identity in contrast with the punctuality of the American dream. Volpert is a figure of historical alterity and in more ways than one. If the book is indeed a uniquely American project, it is also a uniquely queer one. If queer identities (I’m thinking about Halberstam’s In a Queer Time and Place) feature alternative temporalities outside the typical markers of life experience, then Volpert, even with her eggs upright in America’s hand basket, can still offer the reader a queer view of 1976 by proffering herself as a specter and not a spectator: she very simply wasn’t yet born. Volpert gives us 1976 and at the same time questions not only what it means to have been a youth raging in the glorious afterbirth of ’76, but what it might mean to be an adult who sways in the seductive notion that time equals progress. Volpert haunts from the future to look at American independence, rebellion, and lineage, and to answer the question of how we — and she — ended up here. Chelsea Reimann is a fiction writer and book artist. She is spending the year abroad with her partner. Her current city is Sliema, Malta.